John Trumbull’s famous painting of the Declaration’s presentation hangs today in the Capitol Rotunda. It is collectively owned by the citizens of the United States. A few days ago I wrote about an abomination of a bill that the House of Representatives narrowly passed, posing as tort “reform” in medical malpractice cases. It wasn’t really “reform” (which implies improvement), but rather, a bill that seizes power from the states, grants protections and immunities to negligent people for their conduct that injures others, and foists much of the costs for those injuries out of the private sector and onto the wallets of the taxpayers. But it did something else too, and I saved that for today. It also pissed on the Bill of Rights, specifically the Seventh Amendment. Part of the law restricts pain and suffering awards to $250,000, and it also pushes many state actions into federal court. The “problem” is the Seventh. It is a problem for those that want to seize federal power. Everyone else calls it a protection. Because that is what the Bill of Rights is, a list of protections. So the Founders decided that any significant suit (with $20 being the arbitrary limit) shall have the right of trial by jury. Notice that there is no arbitrary top limit? Yet that is what a Republican majority of the House did — it imposed an arbitrary top limit that does not exist, thereby stripping away the constitutionally protected right to a trial by jury for the most seriously injured of people if this bill should become law. I post on this subject each year, and the words that follow are an adaptation of those prior messages. And the Declaration of Independence is reproduced in full after that. I like to read it in full each year at this time. 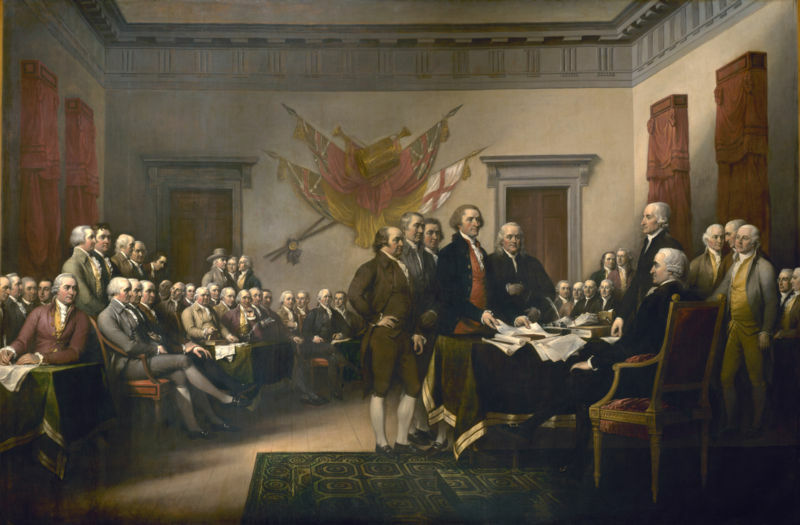 The Declaration has, as its heart and soul, a discussion of how King George III seized too many powers. And the colonists believed — and were willing to risk their lives for the principles — that power should more justly reside with the people. And in the subsequent Bill of Rights, there are three separate places where rights to a jury are established: In the Seventh Amendment (for civil trials), the Sixth Amendment (for criminal trials) and the Fifth Amendment (grand juries for capital or infamous crimes). It is clear that the Founders wanted powers related to both civil and criminal fact-finding to reside with the people, and not with any head of state that may be subject to whim, politics or the pressures of the moment. This tug-of-war over how much power should reside with government and how much with the people exists to this day. Speaking broadly, it is the conservatives who want to see a smaller, less powerful government and liberals a bigger and stronger one. But oddly enough those principles seem to fall by the wayside in the discussion of tort “reform.” When it comes to that, some conservatives, for reasons that have never been explained to me, want to give various governmental protections and immunities to others so that wrongdoers can’t be effectively hauled before the court for accountability. This abandonment of principle happens in the pursuit of …what? I can’t even finish the sentence as I still can’t fathom it, despite having written now on the subject for so many years. To those conservatives that read this blog, I urge you to re-read our Declaration (and Bill of Rights) and ask yourselves why it is that, for this issue, principles of smaller and less powerful government have fallen by the wayside in favor of granting governmental protections and immunities. Long ago, in an online forum different from this one, I posted my opinion that in 100 years or less, if we keep going the way we have been, the US will revert to monarchy. My reasoning was (and I guess, still is) that monarchs traditionally ascribe their ultimate authority to God (insert God of your choice). In the US we are seeing more and more wealth and political power concentrated in fewer and fewer hands. There must come some tipping point at which the massed wealth and political power will be insurmountable by law or economy or voting, or even revolution. So then, having gained everything material, how will the elite justify their exalted position? By invoking Almighty Power of a God-given monarchical providence and rights of accession. So, think of future HRH Donald I, Princes Eric and Donald II, Princess Ivanka, and Michael, the Duke of Indiana, Chris, the Earl of New Jersey, and, by special rabbinical dispensation, Viscount Kushner.of Manhattan. As for me, I will read John Keats Ode to a Nightingale. July 8, the Internet reacts to Princess Ivsnka sitting at the BigPerson G20 table in the place of HRH Donald I.